• Whoa! NYC's most impressive catering comany - Vérité Catering - is giving up to 69%-Off Private Cooking Lessons or Catering on Gilt City. Gilt in invite only, so click here for your invite and cash in on this for your next party or for your own cooking skills! • Hey Artists and designers who "don't hate animals" (that's you! 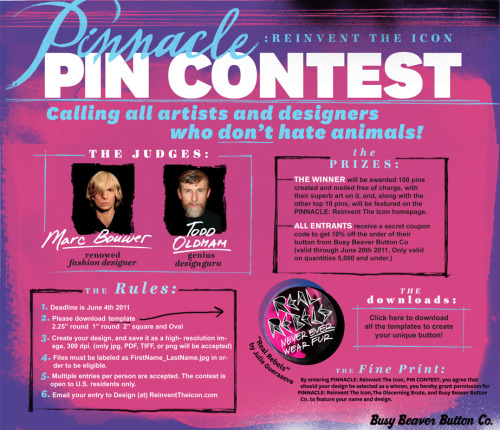 ), enter this cool anti-fur pin art contest and get your work seen by Todd Oldham and Marc Bouwer! PINNACLE: Reinvent The Icon and Busy Beaver Button Co. have teamed up to award one lucky artist with 100 pins in their awesome design (which will be all the rage) and a feature story on the PINNACLE website. Everyone who enters gets a secret code for 10% off the purchase of their pin production from Busy Beaver Button Co so we can ALL make rad anti-fur pins!